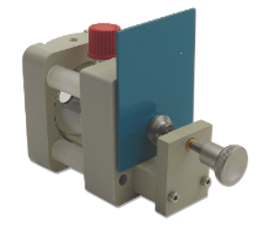 The Delamination Cell is a vertical measuring cell with a heatable glass vessel for experiments on coated samples with a scratch (BMW norm/VW norm). The cell consists of the bottom plate, a plastic ring with an inserted O-ring, double-walled glass vessel with 2 GL18 connections for heating, 2 connections for the leak free separation of the heating hoses, cover, Ag/AgCl reference electrode with an intermediate vessel as Haber Lugging Capillary and a counter electrode of platinized titanium in L-shape. The maximum width of the sheet is 120 mm, the contact opening of the glass is about 94 mm. For uncoated samples crevice corrosion can appear through the seal at the pressure point. Lid, bottom and mounting parts of the cell are made of acid-resistant polypropylene. 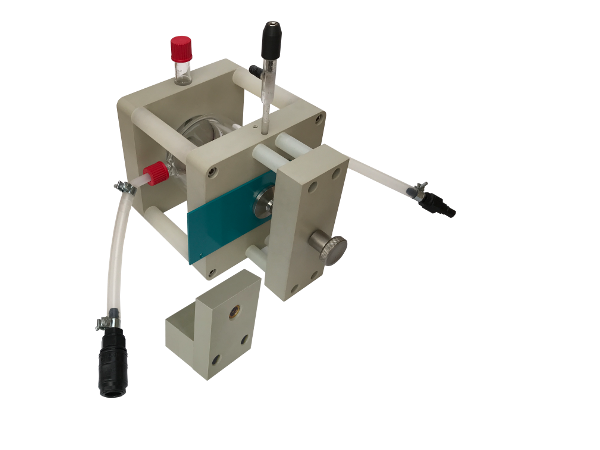 The proprietary Devanathan cell represents an appropriate instrument for measuring the hydrogen permeation through a (steel) plate. The Devanathan cell consists of two measuring cells, which are connected via a semi-permeable wall or membrane. Substituting this membrane sample by a metal (e.g. steel), the permeation of hydrogen, which is generated on one side of a sample (in first measuring cell), can be measured in the second cell. 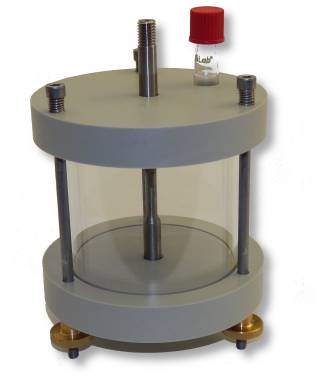 The Cathodic Disbondment Test Cell is a bottomless transparent tube, 75mm diameter, with lid, counter electrode of platinized titanium and a reference electrode (Ag/AgCl). The lid has two holes for counter- and reference electrode, the tube is fixed at the sample with silicon. 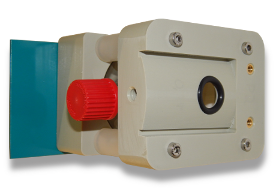 The Tube Cell is a vertical measuring cell for tests with a load instrument. The cell is not heatable with a round lid and bottom plate of polypropylene (thickness 20mm, diameter 140 mm). It has a central bore 10,5 mm diameter to insert round test specimen. Lateral bolts with nuts bolt bottom, glass and cover together. The sealing of glass to bottom/cover is realized with O-rings. Operation without overpressure. As corrosion measuring cells we provide the types KMZ 3 and KMZ 5. Both measuring cells are three electrodes measuring cells for potentiostatic measurements of research the corrosion behaviour of metallic materials. The measuring cell KMZ 5 could be thermostated by use of a double-walled glas container. Thereby a complete measurement setup is available for those measurements even at higher temperatures. The measuring cell mounting plate with standard taper joints (NS) for the pick-up of working and counter electrode as well as intermediate vessel with reference electrode and liquid junction tube including a Haber Luggin capillary. The measuring cells feature practice-orientated handling for a wide range of application. Sample mount / holder (WE), counter electrode, reference electrode (Calomel), current key, intermediate vessel, gas inlet and discharge. The pictured thermometer above is not included in the product contents! The IPS FlatCell is a self-development and it is used for studies of flat samples, which will be flange-mounted sideways. 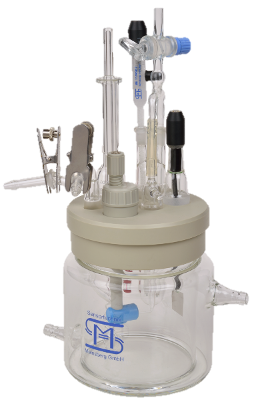 In difference to the other cells of this kind, which are available, our cell is equipped with a double walled glass jar, so it is heatable. The first customer measured temperature-dependent the impedance of coated samples with a plausible and reproducible solution. The cell is constructed robust. The counter- electrode consists of platinum-plated titanium, is provided with a 4mm hole for standard banana plugs and it is screwed in plastic. The bonding takes place in an easy put in of a banana plug. At the front the sample sheet will be inserted between the screw connections and clamped with a screw. The screw passes through a piece of brass, which is fixed to the screw connections. If larger panels are used, a U-plate can be set below and the upper screws can be sunk. Then a lager plate can be inserted from the top. The locating screw for the sample is also provided with a 4mm hole, so a simple banana plug suffices for bonding. 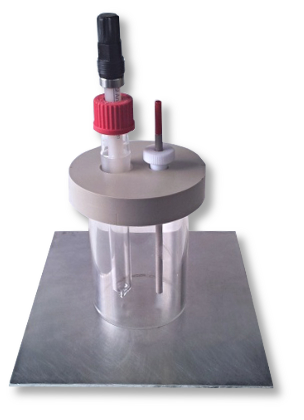 The reference electrode is inserted into the top of the plastic plate, the tip ends immediately in front of the sample panel. Thereby in the glass are no feedthroughs. Just both of the glass screw connections for thermostatization are in the outer sheath of the glass jar. ZRA-FlatCell is a modified IPS FlatCell. The basic idea is, to use this cell for measurement of short circuit current between two samples. At both sides a working electrode can be tapped and then connected with a ZRA for measuring of short circuit current. Of course this order can be used for the measurement of electrochemical noise. It is also possible to flange at the one side a counter electrode and at the other side a working electrode. The filler hole can be used for dipping a reference electrode. With that this cell would be a normal, not heatable FlatCell. 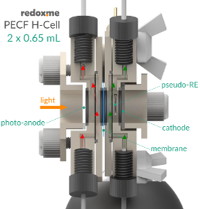 This is a horizontally mounted, double compartment Photo-Electrochemical Flow H-Cell used to simultaneously investigate thin film photo-anode and photo-cathode. The cell elements are made of PEEK. It well fits aqueous (EPDM O-Rings) and organic solvent (FFKM O-Rings) electrolyte requirements. The construction is liquid-tight having two separate chambers, each equipped with electrolyte inlet and outlet. 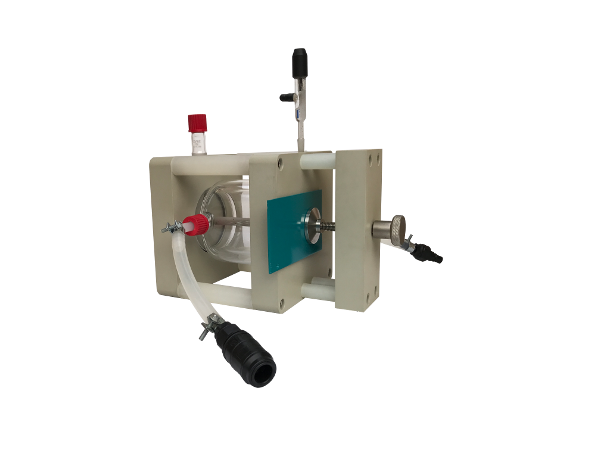 This allows solutions flow and evacuation of reaction products. Chambers are separated with an ion-exchange membrane (e.g. DuPont’s Nafion® membrane), so the electrochemial products appearing at photo-anode and cathode do not affect the opposite electrode. This cell has been designed to investigate performance of a thin film photo-anode/photo-cathode (e.g. nanocrystalline material or conducting polymer) deposited on a rigid or flexible transparent substrate (typically fused quartz glass). The thin film photo-cathode (counter electrode) deposited on a rigid or flexible substrate is mounted in the second chamber. Two pseudo-reference electrodes are mounted in flow chambers. 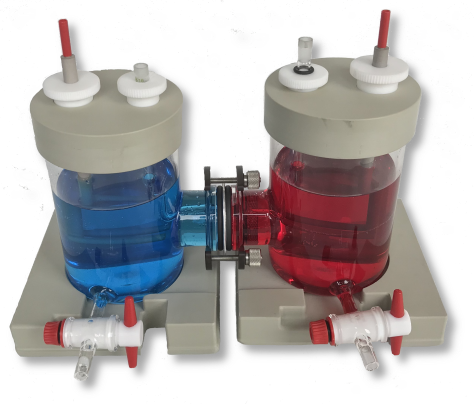 The cell should be connected with two external electrolyte reservoirs to circulate the electrolytes using peristaltic pumps. 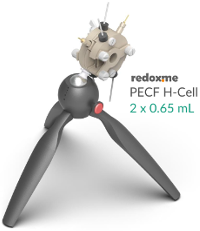 These reservoirs may be equipped with electrodes (e.g. pH meter probes) and the exhaust gases may be supplied to gas analysis (e.g. Gas Chromatography). A gas purging (via mass flow controller) and ice cooling may also be applied.